:When Annie Jacobson's brother Mike enlists as a medic in the Army in 1967, he hands her a piece of paper with the address of their long-estranged father. If anything should happen to him in Vietnam, Mike says, Annie must let their father know. In Mike's absence, their father returns to face tragedy at home, adding an extra measure of complication to an already tense time. As they work toward healing and pray fervently for Mike's safety overseas, letter by letter the Jacobsons must find a way to pull together as a family, regardless of past hurts. In the tumult of this time, Annie and her family grapple with the tension of holding both hope and grief in the same hand, even as they learn to turn to the One who binds the wounds of the brokenhearted. Author Susie Finkbeiner invites you into the Jacobson family's home and hearts during a time in which the chaos of the outside world touched their small community in ways they never imagined. 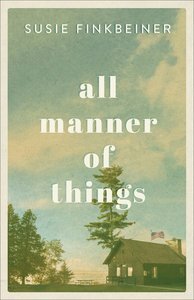 About "All Manner of Things"
Susie Finkbeiner is a stay-at-home mom, speaker, and author from West Michigan. Her previous books include "Paint Chips" (2013) and "My Mother's Chamomile" (2014). She has served as fiction editor and regular contributor to the Burnside Writers Guild and Unbound magazine. Finkbeiner is an avid blogger (see www.susiefinkbeiner.com), is on the planning committee of the Breathe Christian Writers Conference, and has presented or led groups of other writers at several conferences.